If you have kids you have probably dealt with a messy unorganized bathroom at some point. My little ones are 4 and 1 and want to do everything by themselves. They try, oh do they try, to brush wash flush and put things away. It occurred to me that one of the big problems is how our main bathroom is organized. Everything is on an adult level, so try as they might the little ones have a hard time putting things away. 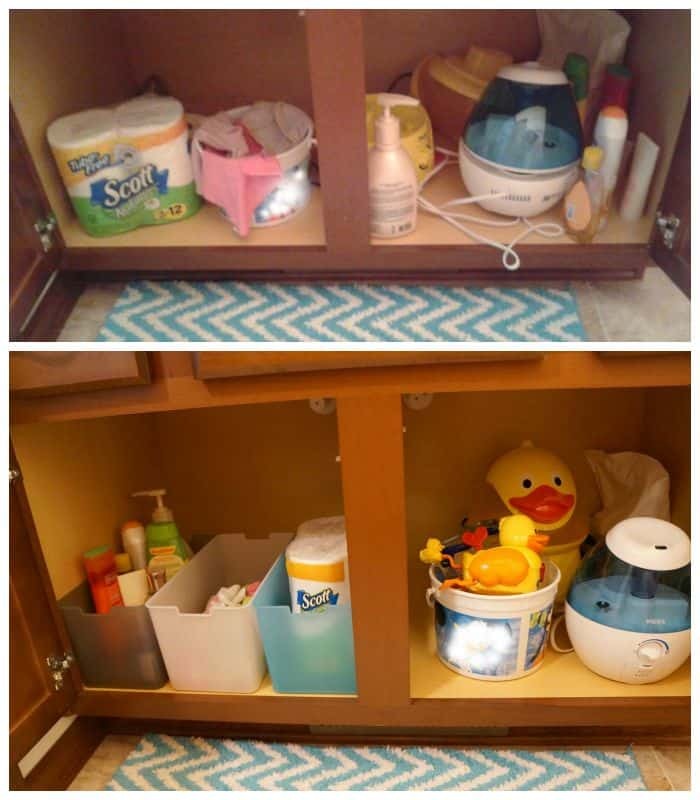 I made a few changes to our main bathroom that will help control the mess and allow my kids to pick up and put away their bathroom items. 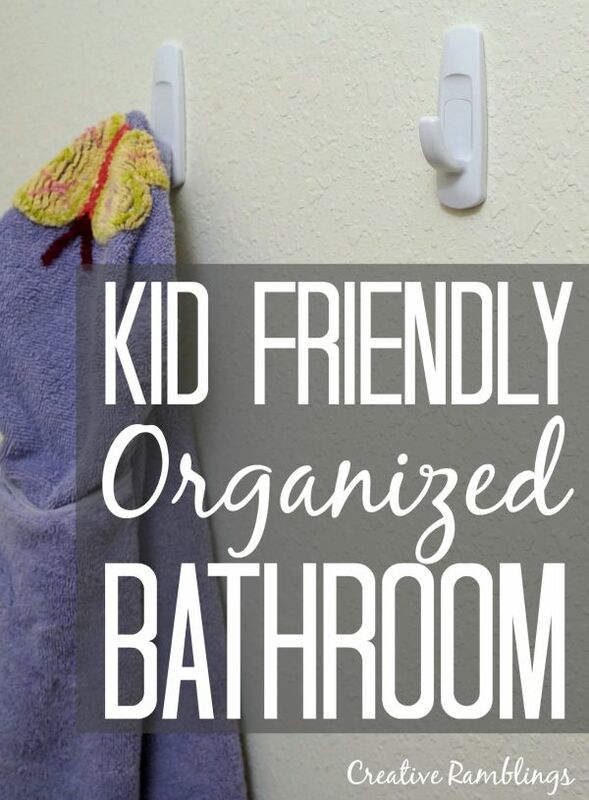 Take a look at these simple ways to create a kid friendly organized bathroom. Our daily messes come from bath time and brushing teeth. We also have a large under counter cabinet with no organization what so ever. I decided to tackle these problem areas with a little kid friendly organization. When I organize my home I shoot for really simple solutions. Keeping it simple means less stress on my part, less money spent corralling my clutter, and typically less impact on the environment. Whenever possible I try to use bins and boxes I already have to lessen my environmental impact. 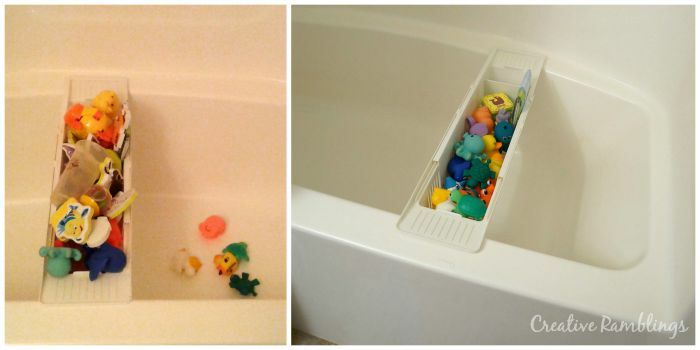 We have a toy bin in our bathtub for all the bath toys. The problem here was an abundance of toys. I put some away under the sink so the kids have room in the toy bin for their favorites. A really simple solution that just took time, no extra money or bins. When they get out of the bath they reach for a towel from the adult height towel bar and pull. This bar is already coming loose and I’m afraid it will pull out of the wall. (That’s happened in our downstairs bathroom.) 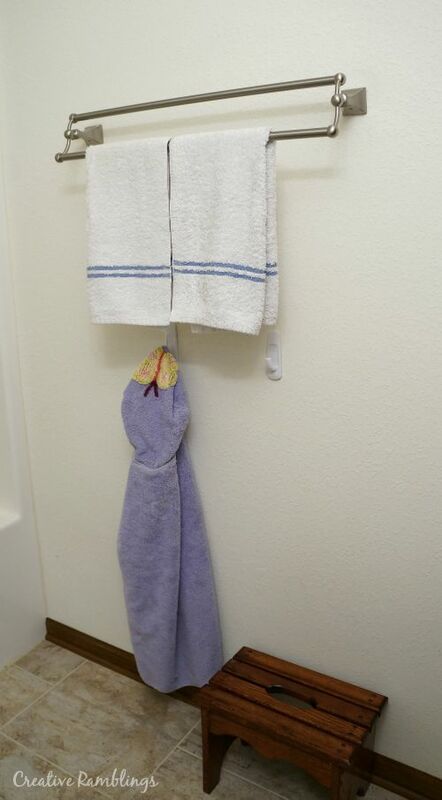 I left the adult towel bar in place for hand towels and added two plastic hooks at a kid friendly height that can be easily removed from the wall when they grow up. Now they can reach their own towels and put them back when they are done. We have two stools in our bathroom, one for each kid. They are able to reach the sink and water fairly well but spend a good amount of time digging through random stuff in drawers to find what they need. 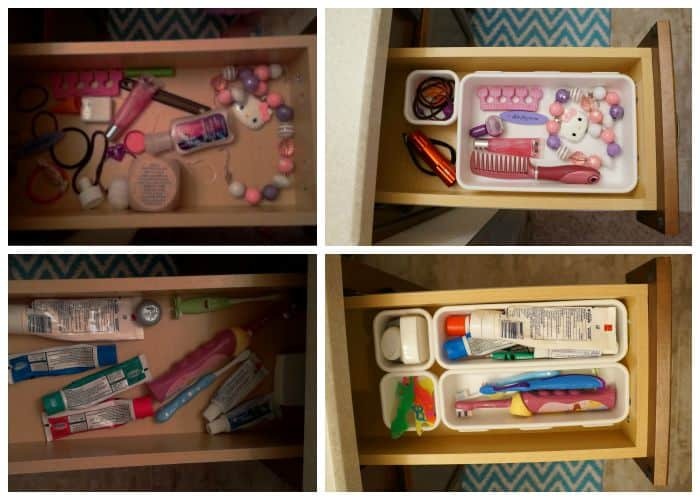 I found some inexpensive modular drawer organizers at Target and used them to corral the loose toothpaste, extra toothbrushes, floss, hair ties and everything else. Another simple solution that only cost a few dollars and a little time. We have a good amount of storage space in this bathroom, it just wasn’t being used efficiently. It was a mess of bath products, toilet paper, wash cloths, toys and more. I found 3 plastic bins at Target to organize the items we use regularly. By putting these items into bins the kids can help put things away, everything has a place and is less likely to get piled up. I used one bin for bath soap and lotion, another for wash cloths, and a third for toilet paper. I have worked with my oldest on how to replace a toilet paper roll and it starts with being able to find a new roll close by. No digging under the sink or leaving the room to find a new roll. These were all easy fixes that didn’t cost much and will give my children the opportunity to help in the bathroom. They are at an age where to want to help with everything so I’m making sure they are able to. I also like to teach them about simple solutions to problems and messes that don’t cost a lot of money and have a relatively small environmental impact. I want my children to not only help with keeping the bathroom clean but focus on being less wasteful. A few small habits can make an impact on the environment and our utility bill. By encouraging the girls to hang up their towels, we are doing less laundry and saving a little water. We also make sure to turn the water off while brushing teeth to save water. Turning off lights when we leave a room is a habit my oldest developed as soon as she could reach a light. It may not seem like much, but a few cents for every light left on does add up. I switched to Scott Naturals Tube Free in our house to lessen our environmental impact. This toilet paper has no tube! Our country throws away something like 17 billion tubes each year. A tube can be recycled but not making the tube in the first place is even better, think of the impact this could have. 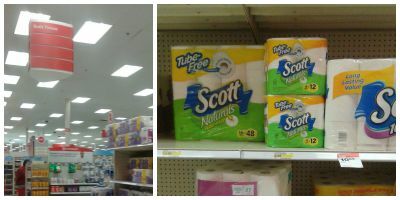 Now is a great time to try Scott Naturals Tube Free at Target, it’s easy to find in the bathroom tissue aisle at Target or online. Grab this coupon for $2 off, almost 50% off the regular price of a 4 pack. I love my clean and organized bathroom and my kids actually picked up and put things away after bath this weekend! It’s amazing what they can do when given the right tools. 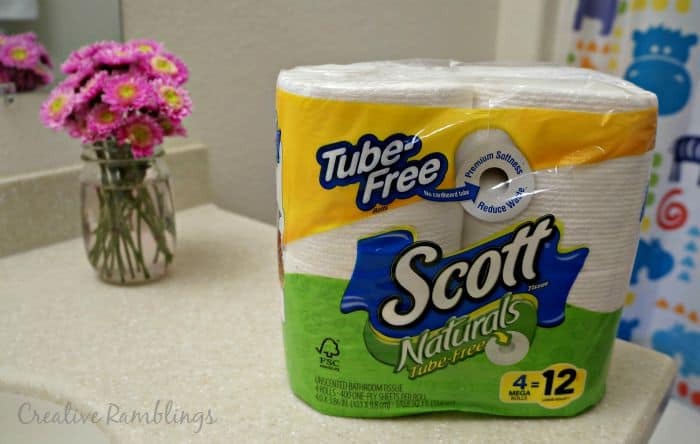 I’ve shared my tips on getting ours clean and green with Scott Tube Free, tell me about your bathroom. How do you keep it clean and organized? Thanks for the sweet comment. I’m seeing that hooks are the way to go, just so much easier for everyone!